The Czech Republic should remain the Czech Republic, and Europe Europe, but this is threatened by illegal migration from Muslim countries, undermining the Christian foundations of European civilization. This was announced by Prime Minister of the Czech Republic Andrej Babiš speaking on the air of the Prague TV channel "Prima". According to the Czech prime minister, stabilization of the political and economic situation in Libya, assistance to its authorities in stopping the smuggling of "refugees" into Europe, strengthening the external borders of the European Union are a key task in the fight against illegal migration. Babiš pointed out that the Libyan border guard is "very effective," and it will cope with its tasks even better when one government appears in Libya, to which the EU should contribute. The next stage is the conclusion with Tripoli of an agreement on combating illegal migration, such as what the EU has with Turkey. The Czech Prime Minister also expressed satisfaction that in Germany at the governmental level, the attitude towards illegal migration began to change. It happened, Babiš is convinced, because of the growing protests of the indigenous population against migrants from Muslim countries. The head of the Czech government often and for a long time speaks on this subject. Several years ago his statements seemed to many to be too harsh, today it's not so. Being in Rome at the end of August, Babish confirmed after negotiations with his Italian counterpart Giuseppe Conte that his country "does not intend to receive migrants ... because the endless reception of refugees in Europe is not a solution to the problem". Babiš stressed the need to develop within the EU "a global plan for how to stop illegal migration." After the talks in Rome, he flew to Malta, with the authorities also discussed as the main topic the opposition to illegal migration through the Mediterranean. From the words Babiš goes to work. The Czech prime minister occupies an absolutely sound position on this issue. He is convinced that European countries do not need other cultural, often aggressive and at the same time dependent migrants who are not going to integrate into European life. In an extreme case, if one can not do without this, he believes, Ukrainians can always be used to fill non-prestigious vacancies. 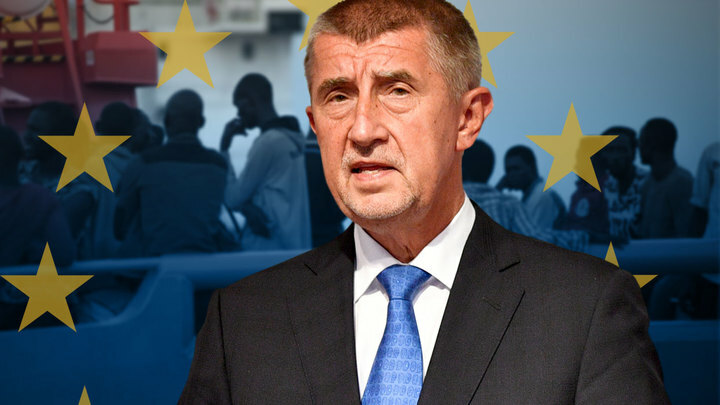 Babiš warned that the Czech Republic would not accept any more refugees from those who crossed into the European Union via the Mediterranean, since they accept people from Ukraine. You can not be children trying to shelter all the stray cats and dogs in the house. By the way, the Czech Republic for a few years only took a couple of dozen illegal migrants according to the EU quotas and does not intend to do so any more. Realizing that the policy of Brussels, Paris and Berlin on this issue is so far different, Babiš is looking for allies in Europe and outside the Visegrad Group, the countries that are part of this (and in addition to the Czech Republic, Hungary, Slovakia and Poland) categorically refuse to show "solidarity" "And take on illegal quotas of EU illegal migrants. As the Europeans perceive the threats associated with them, the number of Czech allies in Europe is growing. Now Austria and Italy were added to their number. Adherents of Babiš are in power in neighboring Bavaria, where the Czech prime minister visited in July. What he was told there, further strengthened him in the correctness of Prague's policy: "Illegal migration must be resisted at all costs." When I hear about the actual situation in Germany, I do not want such a situation to arise with us. I definitely do not want that after a certain number of years we had more emigrants than our own citizens, as it may be in some EU countries, " Babiš said after the visit to Bavaria. And he made a logical conclusion: "We must take care of our people, we can not try for everyone." According to the Czech prime minister, "to proceed from the fact that illegal refugees will necessarily sail, it is not right, it is necessary to help them in their places of residence." Babiš stated that migrants split the societies of European countries, where they had enough problems without them, that "the multicultural model of society threatens the traditions and values of ancestors", and Europeans will necessarily punish the politicians who force them illegal migrants in the elections to the European Parliament next year. It should be noted that the Czech Republic is very fortunate with its top officials. Recently, the newly elected president of this country, Milos Zeman, takes exactly the same position as Babiš in relation to illegal migration and related threats. They are politicians with a strategic vision, otherwise they would not be so concerned about the migration problem in a country where the number of Muslims is less than 1% of the population. So, according to Zeman, if the EU does not do anything in the next few years in this sphere, "we will have 10 million refugees here," whose lifestyle and traditions are "incompatible with European culture, which they understand themselves." The President of the Czech Republic is also concerned that migration leads to a significant increase in crime and violence, the emergence of Islamist ghettos in Europe. Since the beginning of the migration crisis of 2015, Zeman has warned: the bulk of illegal migrants who have flown to Europe do not deserve any compassion at all. Because behind the children, as a "living shield," young, healthy and financially secured men who are hiding in their pockets - iphones and thousands of euros or thousands of dollars. As you can see, Czech leaders understand everything perfectly and see an operation to replace the population in Europe in its true light. Europe will be able to avoid premature death only in the event that there are more such politicians, and its peoples will soon be freed from some myths and illusions. Judging by the events in Chemnitz, it's not far off. The upcoming parliamentary elections in Sweden, a country already half captured by aggressive migrants, are expected to confirm that Europeans are going to fight for their future - nothing is lost until everything is lost.